Compliance processes in heavily regulated industries can require repeated, tedious and labor intensive documentation and control monitoring by management and control testing by audit. The cost is high and the reliability of manual control monitoring and testing is not always consistent due to the human factor. Today’s automated control monitoring technology has the ability to drive down cost while driving testing and monitoring reliability to maximum levels. 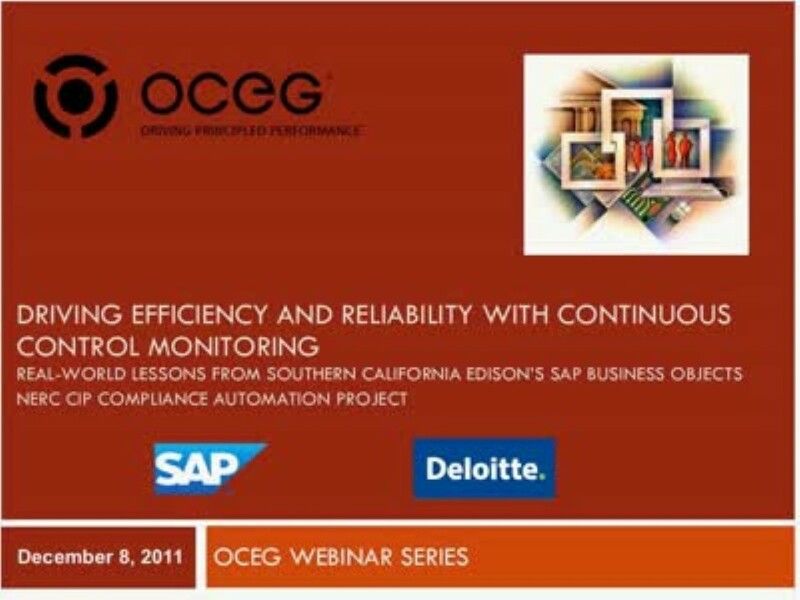 Join us for a case study by Southern California Edison as they illustrate the use of continuous control monitoring streamlining compliance processes relevant to both SOX and NERC. We have emailed instructions to access Driving Efficiency and Reliability with Continuous Control Monitoring to . Make sure the email arrives in your inbox: either add "support@oceg.org" as a safe sender to your email platform, or if you use Gmail, drag our email into your Primary tab.